Just like any other fun or sports activity, paddle boarding implies learning some tips and tricks before you actually get on water. Sure, you'll learn how to do it either way, but it pays off to know what to pay attention to upfront. A few stand up paddle boarding tips will help you learn faster and make your experience more exciting. Newbies may often ask themselves – is paddleboarding fun? Whether you do it as a workout or with your family, it might become your favorite water activity if done right. 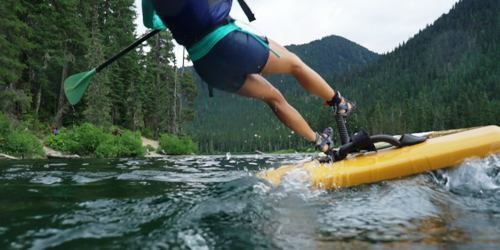 You may not consider the importance of a leash at first, but sooner or later, you'll most likely invest in one (in case your paddle board doesn't have one). It's helpful for you, as well as the people around you. There are more types of leashes out there, as well as specific attachment solutions. It depends on what kind of paddling you engage into. Generally speaking, its main role is to keep the board next to you on fast or wavy waters, but also to ensure you don't harm the ones paddling around you. Finding the best stand up paddle board is not everything if you have no idea how to do it in the right way. Simply put, you're trying to paddle while maintaining your stability. But then, the paddle often goes the wrong way. It seems to be more efficient when you stand, as it puts less pressure on your arms and shoulders. Most people will paddle in a trailing position. It works, indeed, but having the paddle in a vertical position will ensure more power and efficiency. This will feel a little unusual. You're basically using your arms to paddle, yet most experts recommend using the core instead. Core muscles are stronger than arm muscles, so they offer more efficiency to your strokes. Use your arms only and you'll feel tired within a few minutes. Plus, you won't get enough power and speed. When you use your core to rotate and push, you'll only have to keep the arms flexed without moving them too much. At some point or another, everyone ends up falling while paddle boarding. Whether you attempt a paddleboarding workout or you do it for fun, it's just part of the game. Falling the right way is more important than trying not to fall because it can prevent unwanted injuries. Simply put, try to fall away from the board. Push yourself through the air when it's about to happen. Boards are hard and can hurt you. Imagine biting it as you fall – not a good feeling. Don't worry about the board as it won't go away, especially if you have a leash on you. In the end, these are the most important stand up paddle boarding tips to focus on as you learn. Everyone can learn how to do it properly, but knowing the basics will ease your experience. So, are you ready to paddle board? Check out our article on the best SUP in the market today.